Welcome to the first post in Lion Simon Moss’ Blog. I am 52 years old, married with two grown up daughters, Sara and Jo, and one grandson, Lewis. I live near Birmingham, UK and work for The Insolvency Service as an IT Manager. I joined Lions Clubs International in January 1992 and have been a member of Marston Green and District Lions Club ever since. I am currently secretary for my Club and Region Chairman for District 105M. 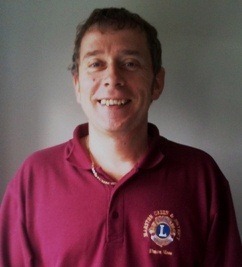 In addition I am webmaster for both my Club’s and District’s web sites www.marstongreenlions.org.uk and www.lions105m.org.uk respectively. In March 2011 I was elected as 2nd Vice District Governor for District 105M for the Lions’ year 2011-12. To celebrate this I have decided to venture into the blogosphere. Over the next weeks, months and years I intend to use this blog to let anyone who’s interested know about Lions Clubs International, my Club, my District and my life as 2nd VDG elect through to, hopefully, District Governor in 2013-14. I will start over the next few days to let you know a bit more about Lions but in the meantime you can find more information at www.lionsclubs.org.